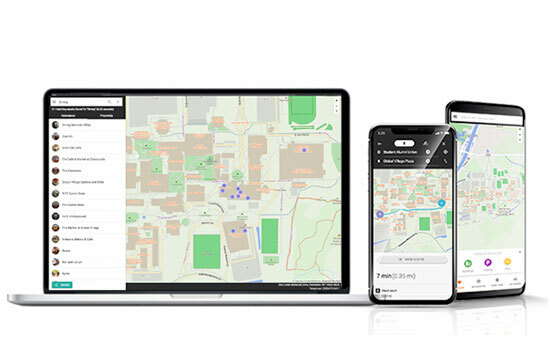 The Campus Map team has released a new desktop version of the Interactive Campus Map. The desktop browser version looks and behaves similar to the mobile version but maintains its features and functionality. Improved search lets you choose from a smarter suggestion list or enter your search term to view a list of all results. Improved share feature allows you to quickly share a single location or a group of locations or search results. Improved directions for walking or biking. New building entrance selection lets you get directions to handicap-accessible doors or specific entrances. Improved integration with major campus events. Check the map for Brick City Homecoming and Henrietta Campus 50th Anniversary events and tours! “Save Your Parking Spot” reminder helps visitors remember which lot they parked in and get directions back to it. To learn more, go to rit.edu/its/map.